I have a dig system that is as global as I could think of doing it. Basically where ever there is grass or dirt (and the shovel is equipped) the player can dig up the ground. There is a chance for gold. Now my only problem is not allowing for the player to dig a hole under a NPC. I have a Common Event for the Chance of Gold and an event for the Hole. 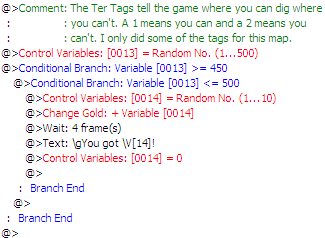 And using ter tags on the map the event can read if the Player can dig there or not. I've tried a few different things and searched around and I got nothing. I know that I could use Variables to track the NPC and restrict it that way. But that would be a lot of Variables. I have attached a project with just the Dig Event System. If you can think of any way I can do it differently OR the same and not have to use the Variables it would be great. Please help!! And thanks for your time. If you have any questions or feed back please tell! I don't say bless you when people sneeze, cause i'm not God. Blessing people is his job. Lolo? Why don't you have the player dig on the exact spot they're standing on? You could also make the digging more rewarding, and also less rewarding. @>Message: You found 10 gold! @>Message: You found a Potion! @>Message: You found 30 gold! Currently looking for help with some HUD scripts! And for both of these conditional branches, if they are not true move the event to the player's last location (using Variable 11 and 12) and set it to become a hole, also don't forget to trigger the common event. I haven't used XP in years, but a bit of advice: Unless it's a minigame where you get a certain number of digs(like that island in Zelda: Phantom Hourglass) then I'd suggest getting a script or something to manage the holes appearing or you could run into problems. I disagree, getting a seperate script for every single minigame is too much. You can't expect the forums to write hundreds of scripts for you. If it can be done with events: use events. It is not all that difficult, especially in this case.